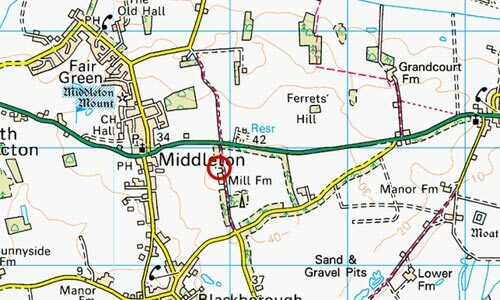 Middleton Mill Farm had two postmills that stood side by side one just to the south of the other. One of the mills was known as the great mill and had a roundhouse. A horse boulting mill and a baking office were also operated on the site. Lease and Release in Trust. (1) Abraham Sewell, senior, late of Shouldham, now of Swaffham, grocer; Joseph Ransome, late of Wereham, now of Great Yarmouth, miller; surviving Trustees of Lease and Release dated 13-14 Nov 1741. (2) John Birkbeck of King's Lynn, banker; Joseph Loombe of Narborough, miller; Abraham Sewell, junior, of Swaffham, grocer; Richard Ransome of Westacre, miller; John Langley, junior, of Wereham, woolcomber; John Hallam of Middleton, Norfolk, miller; Thomas Gales of King's Lynn, druggist; Zachariah Clarke of Deaver, Norfolk, yeoman. A Complete modern built MESSUAGE or DWELLING HOUSE with all requisite offices and six acres of land in Middleton in the county of Norfolk. Also two Capital POST WINDMILLS, called Middleton Mills, with roundhouse under the great mill, capable of containing 14 score of wheat, going gears, a complete horse bolting mill and baking office with a large granary over it. The above messuage is entitled to a right of common and is much noted for the healthfulness of its situation. The Premises are freehold and possession may be had immediately, as the proprietor intends to decline business. The situation is good for both wholesale and retail trade and convenient for the markets being four miles from the port of Lynn, 10 from Downham and 11 from Swaffham. Enquire of Mr. James Trundle on the premises of Mr. Hemington, Attorney, Lynn. A Valuable FREEHOLD ESTATE in Middleton only four miles from Kings Lynn consisting of a substantial family Dwelling house with large Barn, Granaries and other Outbuildings, two Post Windmills fitted up with every convenience and 10 acres of Arable Land in a high state of cultivation. The above Estate is in the occupation of Mr. Robert Sands, the Proprietor who has carried on a very large trade for many years past. Immediate possession may be had and part of the Purchase Money may remain on Mortgage if required. Apply to Mr. Sands or to Messrs. GOODWIN & TOWNLEY Solrs. Lynn. Sale at the Dukes Head, in Kings Lynn, Norfolk on Tuesday 6th September 1831 at 5 o'c. Wanted, a strong active Lad to live in the house, to milk, groom etc. Apply to W. Sutterby, Mill Farm, Middleton. On 14th May 1972, Harry Apling reported that Mr. & Mrs. Roger J. Juggins were living at Mill Farm; Roger Juggins being the grandson of John Drew of Blackborough End mill, his mother being Vera Drew. One of two post mills at Mill Farm was moved to the East Winch Road site, at the top of the hill, where the land was under the same ownership - Matthews.